A leading design company, founded by Giulio Castelli in Milan in 1949, for over 60 years Kartell has been one of the companies symbolising made in Italy design. A success story told through an incredible series of products – furniture, interior design items and lighting – that have become part of the domestic landscape if not actual icons of contemporary design. Since 1988 Claudio Luti, the heir to the “Kartell spirit” has availed himself of the collaboration of the most prestigious international designers (today the team includes Philippe Starck, Ron Arad, Antonio Citterio, Ferruccio Laviani, Piero Lissoni, Patricia Urquiola, Tokujin Yoshioka, Mario Bellini, Ronan and Erwan Bouroullec, Alberto Meda, Patrick Jouin, Front, Nendo and Rodolfo Dordoni), and he continues with the same fervour and enthusiasm as the founder to search for new technologies, forms and styles, the fruit of a perfect balance between the design experience of the individual designers and corporate potential and needs. The Kartell collection is polyfunctional and transversal, is user-friendly and has indisputable aesthetic appeal. Colour, irony, an appeal to the senses, transparencies and unique forms for unique objects: the Kartell product is immediately recognisable all over the world for the emotions it evokes, its functional durability and its unquestionable quality. The continuing evolution in the use of materials and experimentation with new technologies searching for new properties are fundamental for product development, whether in seeking new functional features or in developing new aesthetic characteristics. It was this continuing research that brought about the introduction of satin finishes, transparency, flexibility, resistance to atmospheric pollutants, softness and touch. Over the years, Kartell has collected an enviable series of prestigious international awards including nine Compasso d’Oro awards. Founded in 1999, the Kartell Museum, repository of the history of the brand, won the Guggenheim Impresa & Cultura award “for the best corporate museum” in 2000. Since the nineteen fifties the company business has been engaged on two fronts: LABWARE, laboratory equipment, and HABITAT dedicated to furniture, interior design items and lighting (the latter re-introduced successfully into the catalogue starting in 2000). Since 2009, Kartell has also been producing a collection of women’s footwear made of plastic and designed by major made in Italy fashion labels. Over the last 15 years an ambitious expansion plan has strengthened the distribution network and the brand image at the global level: Kartell now exports over 70% of its turnover, counts 130 flagship stores and 250 shop-in-shops and is present in 126 countries. In the nineteen forties the young chemical engineer, Giulio Castelli, who had studied under Nobel prize winner, Natta, dreamt of “producing objects with innovative characteristics, intended to be applications of new production technologies and aimed at economy of materials and process efficiencies”. It was on this basis that the Kartell company was founded in 1949 and began its business producing automobile accessories and household items followed then in 1958 by lighting fixtures and laboratory ware and, with the opening of the Habitat Sector in 1963, furniture and interior design items. Since its origins, Kartell has taken a wholly innovative approach to the design of its products based on technological research and design essential in tackling the “design of plastic materials” which, unlike natural materials, are devoid of any visible identity before processing takes place. In 1988 just on the brink of his seventieth year, Giulio Castelli passed the helm to his son-in-law, Claudio Luti, who took over the trademark. Luti took a new look at the catalogue and, with due respect for Kartell DNA, concentrated his strategies on the product, promoting design research based on quality, favouring tactile perception and surface resonance and availing himself of the collaboration of the most famous international designers, first among whom is Philippe Starck. This fruitful partnership has generated innovative forms and products thanks to Luti’s pragmatism and entrepreneurial intuition and the creative genius of the famous French designer. The fresh approach to materials determined the course and the turning point for Kartell: processing, manipulation and enhancement for a final product that, while entirely made of plastic, took on connotations and modalities rather than formal and even different languages. The turning point came in 1999 when after years of research and thanks to a revolutionary innovation, Kartell was the first company in the world to use polycarbonate for the production of interior design items. The result was the La Marie chair, a completely transparent chair of modern minimalist design. Henceforward, Kartell would develop and explore the theme of transparency which made it so unique and original, and would pursue research into the study of surfaces starting with the use of new technologies and higher performance materials. From its very beginnings, Kartell has been known for its industrial production of top quality design objects made of plastic with high technological content and made in Italy. From its cutting-edge technological choices to its use of innovative and certified thermoplastic materials, often developed together with the best international producers, from production sites located throughout Italy in Piedmont, Lombardy, the Veneto and Emilia Romagna, the heartland of the national manufacturing culture, to the production processes automated for the purpose, among others, of ensuring higher safety standards and to the involvement of the workers themselves in the “making” of the product, Kartell can ensure users of its products that its collection has its DNA in its technology, its quality, its sturdiness and its long-wearing durability. Company technicians follow all the production stages of Kartell products and check and ensure that the technology, the industrial processes and the quality are up to standard and work to harmonise the needs and expectations of the end user with the industrial processes used. It is the high degree of stability and repetitiveness in these processes that makes it possible to minimise inefficiencies and waste in favour of production with little polluting residues which are, in any case, completely recyclable. It is not only their looks that make Kartell products so attractive. Their proven practicality and multifunctionality are constantly being tested and kept under supervision with strict and exacting reliability tests performed in compliance with specific UNI EN regulations. The Kartell sales points are élite places dedicated to communicating corporate philosophy together with the product and, at the same time, to illustrating to the consumer public all over the world its own special interpretation of home living needs. The single brand Kartell sales points are display spaces intended not only to show the customer the eclectic range of Kartell products but also to publicise the brand identity and values: design, innovation, industrial production, versatility, glamour and vivacity. Beginning in 1997 with the opening of its first flagship store in the brand’s native city of Milan, Kartell’s retail strategy proved to be the successful communications approach. Located on the shopping streets of the main cities throughout the world, the stores are neutral containers designed to display products at their best, enhance and communicate the desirability of those products which, featured on large luminous platforms and transparent display cases, are the real and indisputable protagonists with their colours, transparencies and immediately recognisable design. With its most recent openings, Kartell can now boast a total of over 130 flagship stores and 250 shop-in-shops. Another 2,400 multibrand sales points in almost 140 countries throughout the world must be added to these. While Kartell has its corporate museum based at corporate headquarters in Noviglio (Milan) recounting its past history, the brand engages in an intense and eclectic communications promotions with shows, stagings, events and co-marketing activities involving both the international retail network and now the world of social media as well to illustrate the present. The single brand Kartell shops are the brand’s mouthpieces speaking through stagings or dedicated events. One example is the special project, “Louis Ghost – 10th Anniversary around the World”, dedicated to the 10 years of the most famous and iconic Kartell chair designed in 2002 by Philippe Starck. The project ranging from printed media to the web, with photo shots, videos and personalisations of the chair finds the Kartell flag stores ideal as a meeting place and venue for maximum creative expression. 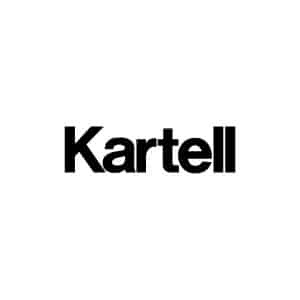 In recent years Kartell communications have focussed increasingly on the web through the official pages of the brand on Facebook, Twitter, You Tube, Instagram and Pinterest which register a constantly increasing number of fans and a high rate of involvement and interaction testifying to how the public identifies with Kartell and its products. Among the publications, the now historic “kARTell” book published in 2002 with the contribution of Franca Sozzani (an extraordinary collection of over 150 interpretations of Kartell products seen through the eyes of prestigious photographers, contemporary artists and writers) is followed by the first monograph dedicated to the brand, “Kartell – The Culture of Plastics”. Published by Taschen, this 400 page book recounts the extraordinary history of the brand which, perhaps more than any other, has produced veritable design icons. A successful alliance is certainly the one with the world of fashion expressed through numerous special designs for all the Mademoiselle à la mode armchairs. The Starck armchair starting in 1997 was “dressed” by a series of Italian and international fashion names such as Valentino, Dolce&Gabbana, Missoni, Moschino, Etro, Burberry, Jean Paul Gaultier, Christian Lacroix and many others. In 2012 for the Salone del Mobile, the American rock star, Lenny Kravitz, was invited to dress the famous armchairs and he upholstered them with python, fur, leather and woven materials for a final result that mirrors the wild spirit of the rocker and the eclecticism of the brand. The Kartell Museum was established in 1999 to celebrate Kartell’s fifty years of business and to illustrate the extraordinary alliance between plastic and design. Container of 1000 objects, designed by Anna Castelli Ferrieri and Ignazio Gardella, the Kartell Museum occupies about 2500 square metres in the building in Noviglio (Milan). The original display route devised by Ferruccio Laviani gives visitors an immediate reading: the collection is arranged in chronological order over three floors and the general layout is divided into the following categories: shows, design, technology and communications. The legends tell the story of the company and present its most important stages. The first rooms are dedicated to the fifties and feature Giulio Castelli’s totally new approach to technological research and to an aesthetic renewal in design. With its rich accumulation of awards, including five Compasso d’Oro awards, in the sixties, the company confidently began manufacturing a series of more complex and evolved products and developed interior design items made of plastic. The seventies were characterised by a new interest in the working environment and in that of collective services and by the development of research in the systems field. In the eighties under the artistic direction of Anna Castelli Ferrieri, Kartell sought to combine industrial logic with a high tech approach while in the following decade Kartell enriched its collection thanks to the contribution of various international designers with whom it began working. Thus objects were produced in response to new needs and became seductive through their captivating design. The exhibition concludes with the successful pieces of the last ten years witnessing the definitive confirmation of the brand as an international design leader and distinguished in its 60 years of history by its central theme of constant technological and functional innovation. In 2000, the Museum received the prestigious award from the Guggenheim for “best corporate museum” and its collections have been requested and shown at the Centre Pompidou, the Kunsthalle in Bonn, at the Triennale in Milan and the MoMA in New York. April 11, 2019BRABBU: We can’t get enough of this dining room …. NEED MORE KARTELL INFORMATION ?